Welcome to the Carriage House on Caroline street in Burlington's charming and historic South End Lower Hill Section. We are ideally located on a quiet residential street, walking distance to Church Street Marketplace, Burlington Waterfront, local beaches, bike path, and so much more. Park at the end of our street with tennis, two playgrounds, soccer, and baseball fields. Excellent for dog walking and frisbee. Hello my name is Dori. As the owner and operator I am happy to welcome you. My day job is as a part time faculty member at UVM and Nurse Practitioner in private practice. My interests are recreational golf or skiing with my sons if at all possible, art, music, and walking the very active small dog you will meet named Jack. I occasionally bike to work from the main house which is less than a mile and along the bike path. The carriage house has two units. Apt A is available as a short term rental as listed and the upstairs unit is for private use at this point. Because it is in the coolest neighborhood in town. Just a short walk to beautiful Lake Champlain, busy cafes, wonderful restaurants and world class breweries. The South End Lower Hill Section is Burlington's most vibrant neighborhood, with beautiful original homes, historic architecture, lovely city parks, lively art scene and busy shopping centers. Both quiet and historic with cute well maintained houses walking distance without the noise of the city or student life of upper hill section. Walk to everything and a couple of blocks to the lake and bike path. Off street for one vehicle. Full kitchen with some spices and all baking or cooking supplies. Full cable, all channels including specialty channels. My husband and I had a wonderful experience staying in Dori’s carriage house apartment. We loved that it was a dog-friendly place on a delightful residential street. Dori was very communicative and helpful. 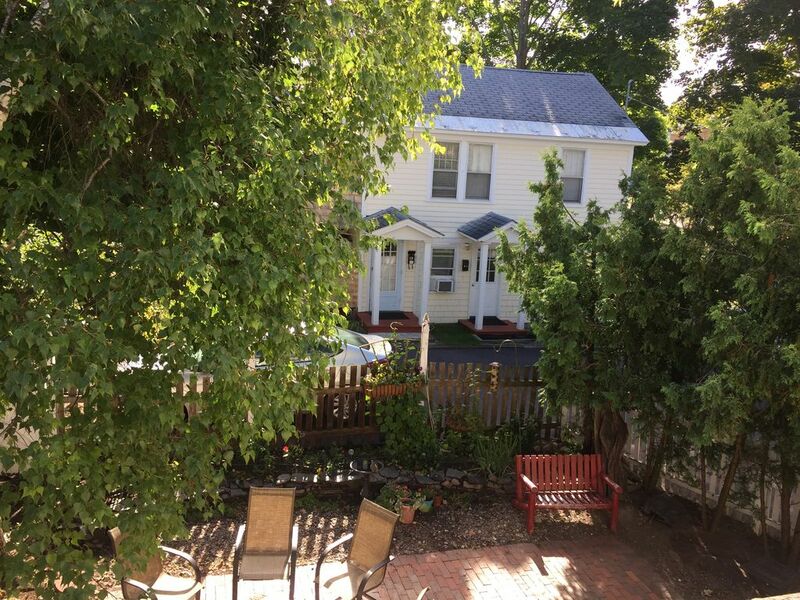 This cozy carriage house is conveniently located near the bike path, the great Pine Street restaurants, breweries and shops, Church Street and the downtown lakefront. Great outdoor activities in Shelburne and the Champlain islands aren’t far either. Dori is a welcoming host with great ideas about how to spend your time in the local area. Our pup was welcomed at the property and many places in the city. We had a great stay here - it's a lovely place and it's in a great location! Lovely property with attentive caring owner. Truly dog friendly with a park down the street and a dog friendly neighborhood vibe. Located in a quiet upscale neighborhood. Walking access to the lake and downtown Burlington. Easy access to grocery stores, fab restaurants and cultural jewels. Be prepared for tiny space making it very cozy for four people. Thank you for coming, property is perfect for two as noted. We had a wonderful graduation weekend at Dori's. Her home is beautiful and comfortable, a home away from home. Exceeded our expectations. Great location and everything you need. This was an excellent property. It was clean and everything we needed for our 3 night stay was available and more, if we needed it. Dori is a wonderful host. It was a pleasant setting and fairly quiet. It is within walking distance of parks and lake. I highly recommend! Thats so nice , thank you so much for coming! I’m happy you guys could enjoy Burlingotn and a visit with you’re daugher last weekend. Bring Jack next time, and please come back soon . House rule suggestions: Pets not to be left alone for long periods of time. Check in times usually by 1:00pm. Check out times 11:00am. WiFi code posted on fridge. Keys are placed in the mailbox. We are available by phone or by coming to main house but will be giving you your privacy if desired. The trash and recycling is our responsibility. Removing the sheets and towels and putting them in bath tub is helpful but not required. Additional sheets and towels are in the closet if needed. Jack the dog living in main house can bark at first but is quieted by talking to him. He has use of the main court yard unless otherwise specified by quests. Loves people including children and treats!